We’re big fans of rice & beans and beans & rice in pretty much any format. 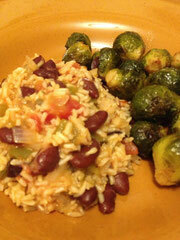 This recipe is really easy to make if you just cook your beans a day ahead or use canned. It all comes together in one pot so there’s not much mess – bonus! We make red beans and rice fairly often and 1000 Vegan Recipes has a nice spin on the dish. We love the kalmata olives and capers in it. Also, it makes a ton so you can take the leftovers for lunch and make your coworkers jealous! We usually just make a simple side of grilled asparagus or steamed broccoli with it. This time I roasted some sprouts. I steam them for about 10 minutes, toss them with olive oil, salt and pepper and roast them until they start to get brown & a little crispy around the edges. Yummers.